Slowly, Slowly in the Wind – loudlatinlaughing – Euge! Euge! He procrastinated, and lit another pipe. He had put a sheet of paper in the typewriter, but this was the title page, and as yet he had written nothing. Suddenly, at 10.15 a.m., he was award of boredom – oppressive, paralysing boredom. He knew the book, it was in his mind entirely, and in fact, why write it? The thought of hammering away at the keys for the next many weeks, putting words he already knew onto two hundred and ninety-two pages (so Cheever estimated) dismayed him. He fell onto the green sofa and slept until 11. He awakened refreshed and with a changed outlook: the book was done, after all, not only done but polished. Why not go on to something else? And so he begins to “write” other books in his head. The second story, Network, is the other one in the collection that doesn’t involve something devious and criminal. It’s the story of a woman, Fran, who’s on disability leave from her job and who becomes the spoke of a network of friends all calling to give and take news of each other. They help a young man get started in the city, a grand-nephew of one of their own, and in the end he offers Fran flowers. 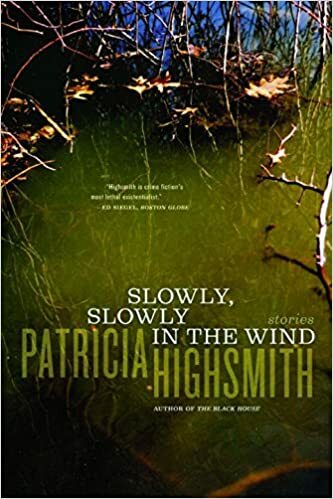 The other tales involve death, murder, stabbings, the usual Highsmith fare. A woman kills an intruder, another woman witnesses her toddler’s drowning in a pool in the backyard before joining him, a delivery boy executes a triple murder in a wax museum but no one believes that he did it. One of the gruesome stories that sticks with me is the eponymous one, Slowly, Slowly in the Wind. Skip, a retired businessman with tons of money, buys a farm and tries to acquire the fishing rights to a piece of the river nearby. Foiled, he ends up murdering his enemy and sticking his corpse up as a scarecrow in his field.